With silly season fast approaching us, it’s a good idea to lock down now the best places to have Christmas nights out. There’s always the safe bet of doing 12 pubs and hitting the usual places and finishing off in Coppers, but there’s a lot of other options if you’re looking for something different. Work nights out mean you finally get to see your co-workers let loose and hopefully someone kisses someone else under the mistletoe, which provides endless entertainment for the next few months. Something different to do this year is head to Dublin’s newest Aprés Ski venue ‘Aprés Dublin’ located just off the Quays in the city centre. Aprés Dublin claim that they have turned the George’s Dock Venue into ‘a giant custom-built ski lodge, with fun Aprés social activities, delicious street food options and an in-house DJ & band’. For anyone who has never been skiing, aprés ski is when everyone goes to the bar straight after skiing and gets jolly on the slopes, where they have great DJ’s and drinking games. 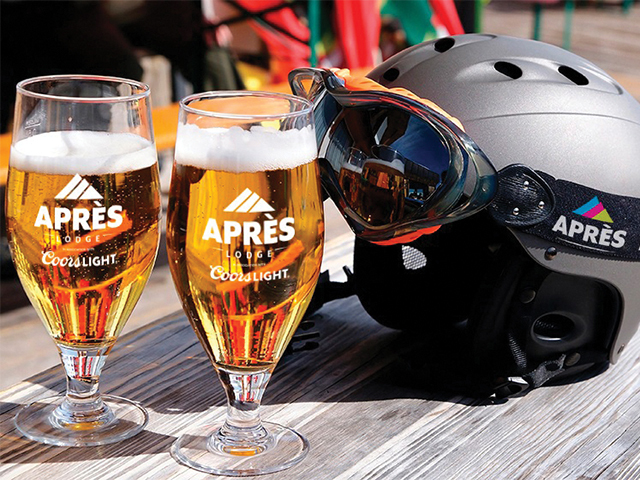 Aprés Dublin takes the best part of skiing, the aprés ski, and turns it into an event for both those who are looking to let loose and party and those who want to bring the kids along for a great time. Clever interior design provides Aprés Lodge, which has the drinks, food, music and where the party takes place. They also have an Aprés Village, which is family orientated with things like carnival rides, Santa’s grotto and market stalls. This is something very different to your average work Christmas night out of just booking a table at a restaurant and heading out for drinks. Aprés is located in the city centre, which means an easy way to get around. Aprés Dublin opens 30th November-23rd December especially to cater Christmas parties, but they accept groups on general admission as well. For afterwards, Xico nightclub is only 10 minutes away in a tuc-tuc. Xico is a Mexican themed nightclub, known for its fun drinks, and brilliant music selection. Another useful tip- on Mondays, all food and drinks is 50% off. It isn’t just known for being a nightclub, it serves food- and it’s delicious! They let you dance on the tables and chairs, while listening to Spanish remixes of your favourite songs. I think everyone wants to see their manager drink too much tequila and dance on a table and capture it on Snapchat. For the annual Christmas night out with the gals or the lads, instead of the usual 12 pubs where everyone peaks too early and someone ends up crying, a perfect place to start your night off is Chai Yo teppanyaki restaurant beside Grand Canal Dock. Chai Yo is a fun restaurant which serves Chinese, Thai and Japanese food. The interior and layout of the restaurant is gorgeous, with the tables all in a bar style around the cooker. Food is cooked in front of customers at their tables with the chef putting on a show. He interacts with all of the guests, even getting them out of their seats and performing tricks. All of their food is incredibly fresh and a wide variety caters for all kinds of dietary requirements. They have a set menu for large groups, which is for €30 per person which includes wine and a variety of dishes. With this menu, clients are given a variety of meat and fish dishes served with egg fried rice. The flavours and freshness of the food is really remarkable. Chai Yo waiters perform live music and encourage the guests to sing along. It’s more exciting than your average meal out. It’s perfect for birthdays celebrations because when staff are told it’s someone’s birthday, they will even whip out the guitar and sing a hilarious song and make that poor person stand up. To follow this fun dining experience, a new hot spot that is very popular at the moment is Nolita on South Great George’s street. This gorgeous New York style bar is a beautiful layout and a huge variety of drinks. If you’re a gin drinker, this is the place for you. They have a huge selection of gins available and will advise you as to what tonic, fruit or vegetable will accompany your gin selection the best. I had my first Hendricks, elderflower tonic and cucumber in there and I can safely say I’ve never looked back. The best part about Nolita is their live music. Every Saturday they have an amazing DJ, but to accompany the DJ, they have a very talented saxophone player and a bongo player. A group called the ‘Riff Shop’ play there occasionally, and if you’re lucky enough to be there when they play, you will have an amazing time. Nolita finishes at 3am, so if you’re not ready to go home Copper’s is just around the corner.